Green Park – Chennai is a modern property in NSK Salai, Vadapalani, just 3 km from the commercial areas of Chennai. It has an outdoor pool, free Wi-Fi and free parking. The well-furnished rooms at Green Park feature a free minibar and bottled water to ensure a comfortable stay. Popular satellite channels can be enjoyed from the sofa seat. A personal safe and hairdryer are included. Guests may exercise at the fitness centre or enjoy a relaxing massage at the Orchid Thai Beauty Salon. Providing warm hospitality, the hotel has a 24-hour front desk and room service. A daily buffet breakfast is served at the 24-hour Tulips Coffee Shop. International dishes can be enjoyed at Once Upon A Time Restaurant, while pool side barbecue is available at Roast & Grills. Refreshing cocktails are served at Mustang Bar and Escape Nightclub. 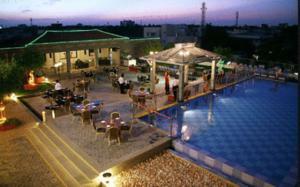 Green Park Hotel is 12 km from Chennai International Airport. Chennai Railway Station is 10 km from the hotel. Free! All children under 12 years stay free of charge when using existing beds. One older child or adult is charged INR 1013 per night and person in an extra bed. Maximum capacity of extra beds in a room is 1. There is no capacity for cots in the room. Supplements will not be calculated automatically in the total costs and have to be paid separately in the hotel.